"I started with Kimber's Shrimp Scampi Bake recipe I found on this site. After reading all the fantastic reviews, I made several changes which really makes it different enough to submit it separately. Serve with freshly grated Parmesan cheese." Preheat oven to 450 degrees F (230 degrees C). Arrange shrimp in a single layer in a 10x15-inch baking pan. Bring a large pot of lightly salted water to a boil. Cook linguine at a boil until tender yet firm to the bite, about 11 minutes; drain. Place linguine in a large bowl. Heat butter, mustard, lemon juice, garlic, and 2 tablespoons parsley in a saucepan over medium heat until butter melts, about 3 minutes. Reduce heat to low; cook and stir until sauce is thickened, about 10 minutes. Stir in white wine. Pour scampi sauce over the shrimp. Bake in the preheated oven for 5 to 6 minutes. Sprinkle bread crumbs lightly over shrimp. Increase oven temperature to 500 degrees F (260 degrees C); continue baking until just lightly browned, 1 to 2 minutes more. Pour shrimp scampi over the linguini and toss. Top with the remaining 1 tablespoon parsley. 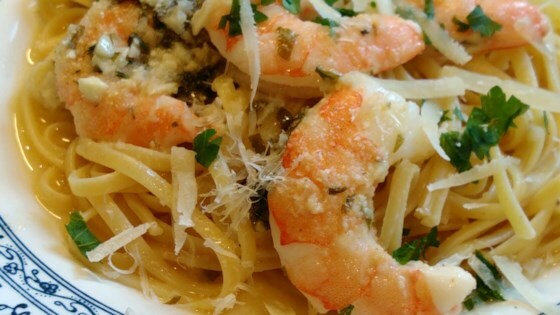 Dijon mustard adds zesty zip to buttery shrimp scampi.